In many ways, we lovers of Italian food here in the US are lucky. The current popularity of Italian food means that you can find just about any kind of Italian pantry product you like, from everyday staples like imported pasta or canned tomatoes to relatively esoteric ingredients like colatura or bottarga. At a price, of course. With a cupboard full with imported products bought at a fancy Italian deli, it should be a breeze to reproduce the dishes you enjoyed on your last vacation in Italy, right? Well, not necessarily. There are still some real challenges, and you’ll encounter the biggest one right in the produce section of your supermarket. The quality of fresh produce in this country can be truly lamentable, and that’s a problem, since quality fresh fruits and vegetables are essential to authentic Italian cookery. Artichokes are a good example. I can’t remember the last time I found an artichoke in a local supermarket that wasn’t crinkled and spotted, its tell-tale open leaves betraying the fact it had been sitting around way too long. I’ve basically given up counting on finding a decent fresh artichoke. But there are some options. Farmers markets, of course, provide an alternative to supermarket chains, even if the prices can be high and the selection limited—as it should be—to stuff that can be grown locally. And frozen vegetables provide a perfectly acceptable option for certain vegetables. We all know and love frozen peas, but frozen artichoke hearts are actually pretty darn good, too. You’ll have to forego recipes like carciofi alla giudia that call for whole artichokes, but they will work perfectly well in the many Italian recipes calling for artichoke hearts cut into wedges. And they’re really convenient, avoiding the rather laborious trimming you need to do with fresh artichokes. 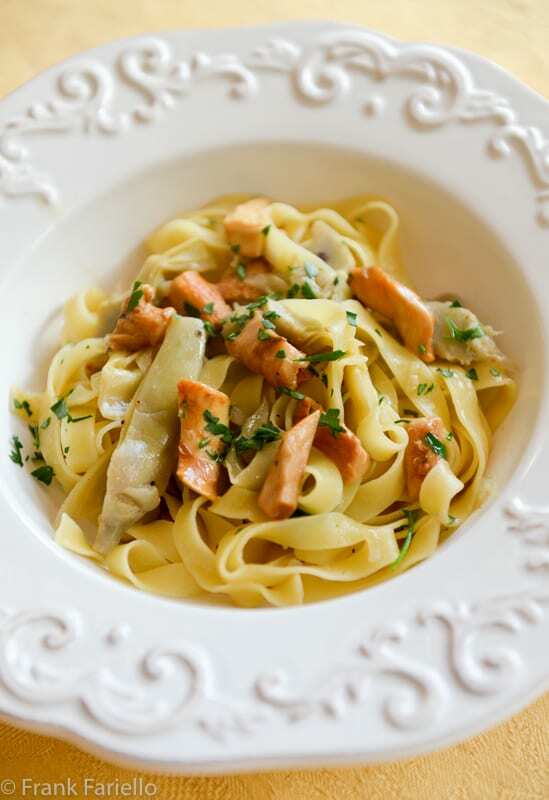 Take today’s dish: tagliatelle carciofi e funghi, or tagliatelle with artichokes and mushrooms. Frozen artichoke hearts are quickly parboiled, then cut into thin wedges and sautéed briefly with shallots and mushrooms, then simmered in broth. This simple condimento pairs beautifully with egg pasta, in particularly the eponymous tagliatelle. An elegant first course that should take you no more than 15-20 minutes to make. In a large saucepan, bring well-salted water to a boil and throw in the frozen artichoke hearts. Let them parboil for about 3 minutes, then run them under cold water and drain. Slice them into thin wedges. Slice the mushrooms or cut them into small pieces, depending on the size and shape of your mushrooms. Melt a knob of butter in some olive oil in a skillet or braiser over gentle heat. Add the minced shallots and let them soften well. Raise the heat to moderate and add the artichoke and mushroom, mixing them well with the shallots. Let everything sauté for 2 or 3 minutes. When the mushrooms and artichokes are almost tender, add a ladleful of the water in which the artichokes were parboiled or some broth, and let everything simmer until the liquid has reduced but not quite evaporated. Add some minced parsley if you like. Keep warm. Meanwhile, bring the water in which the artichokes have parboiled back to a boil. Add the tagliatelle. When the tagliatelle are still just slightly undercooked, add them to the skillet with the artichokes and mushrooms. Mix together, along with a good knob of butter, over very gentle heat until the tagliatelle have absorbed most, but not quite all, of the liquid. (Add more of the pasta water if need be to keep things moist). Serve immediately, with a sprinkling of minced parsley on top for color if you like. For the mushrooms, porcini are the classic choice, but fresh porcini are about as rare a unicorns in the area where I live. This week I found these lovely chanterelles at our local Whole Foods—perhaps my favorite mushroom— and they were delicious. And, in any event, the recipe is forgiving. You can use any kind of mushroom you like. Even with regular button mushrooms, the dish will still be good. You can also use dried porcinis or other mushroom if you like. Soak a small packet of them in warm water until soft, squeeze them dry then add them to the skillet along with the shallots. Add the soaking liquid (filtered to rid it of any sediment) to the skillet instead of water or broth to make the sauce. The dried mushrooms and liquid will give the sauce a dark, intensely woodsy flavor. Very different from this version but very good indeed. For a saucier version of tagliatelle carciofi e funghi, add a spoonful of flour to the skillet after you’ve sautéed the artichokes and mushrooms, let the flour cook for a minute or so, then add a good cupful or more of broth or, if using dried mushroom, their soaking liquid. Let simmer until the liquid has thickened a bit and the vegetables are fully tender. Some recipes call for cream, too. Carnivores may want to add some pancetta along with the shallots to lend more savor to their tagliatelle carciofi e funghi. Use water or vegetable broth if you want a vegetarian version. And if you want to veganize the dish, cut out the butter (using a bit more olive oil) and turn to an eggless pasta instead of tagliatelle. I think penne or pennette would be particularly nice. Melt a knob of butter in some olive oil in a skillet or braiser over gentle heat. Add the minced shallots and let them soften well. Raise the heat to moderate and add the artichoke and mushroom, mixing them well with the shallots. Let everything sauté until both the mushrooms and artichokes pieces are almost tender. Add a ladleful of the water in which the artichokes were parboiled or some broth, and let everything simmer until the liquid has reduced but not quite evaporated. Add some minced parsley if you like. Keep warm. Oh how right you are Frank, produce continues to be the biggest obstacle in recreating our favorite dishes from Italy. Living in the Bay Area access to locally grown fruit and vegetables is a bit better than what is on the east coast. I cringe each time I am visiting family and prepare to cook a holiday meal, the quality & prices are a disgrace. Your preparation of the frozen artichoke hearts is spot on, some fold merely defrost them but they really need a quick boil. A wonderful Fall recipe, thanks you …. Yes, indeed, you Californians are lucky to live close to where so much produce is actually grown. Here on the East Coast we get by. The summers aren’t too bad, as the farmers markets provide some excellent produce—but at a price! Supermarkets not so much… ! Ok Frank, I risk making you jealous, but we have wild karljohansvamp (Swedish porcini) as well as kantareller (Chanterelles) growing in our forest just now. When we pick karljohansvamp, I love making a similar dish, but I’ve not tried it with artichoke hearts. I must give this one a try next time we go foraging in the forest, which will be soon. Lucky you Ron! Now I am jealous, never foraged and wouldn’t know where to start… but the idea of free chanterelles just there to be picked, wow. Thank you for this simple beauty ! It being spring in Australia there is no shortage of fresh artichokes or asparagus, thank God !! I live semi-rurally and each of the five supermarkets within range has piles of beautiful artichokes in their vegetable aisles . . . This will be made tho’ possibly with commercial fresh tagliatellw. For fun may try with some of the half-dozen odd Asian mushrooms to search for flavour . . . Can get all the risotto rices locally, for bottarga et al overnight on-line if the purse allows . . . 🙂 ! Lucky you, Eha! And I’m sure Asian mushrooms would be absolutely delightful in this dish. Simple and beautiful. Wish I could get unique mushrooms where I live, but I can’t. Peccato, as they say in Italian. But as I said in the post, it works with any kind of mushroom… or with dried porcini who can buy online. Any port in a storm, as they say! One of the first jobs I did as a food stylist was shadowing another shopping for groceries at a high-end shop in Toronto. We bought a fairly large chunk of bottarga and the niave cashier punched it in as $2.98 when it should have been $298! I told her right away, of course! These unique ingredients are readily found if you live in a big metropolitan city, like Toronto, but recently we spent a month in Arizona, south east of Phoenix and I was surprised to see how limited their range of imported groceries were. For example, I wanted to make risotto and fortunately Fry’s had arborio but, it was one of only three unique rices! I suppose we are fortunate in Toronto because of our highly diverse population, we have a huge variety of authentic international groceries, both fresh and preserved! We adore artichokes and mushrooms so this dish would be high on our list, beautifully presented in pasta. Even around here (metro DC) some of the more esoteric Italian products like bottarga can be hard to find. But that’s the beauty of online shopping… But yes, it is a wonderful thing to live in a diverse community where you can find international products easily and don’t need to search them out. I miss that. Lots and lots of greetings from Athens! Frozen artichoke hearts have become a staple for me — their flavor is pretty good. Anyway, this looks like a terrific dish — inspired stuff. Thanks! The combination of flavours in this dish are wonderful – artichokes and mushrooms – a perfect pasta dish. I’m not sure that we can get frozen artichokes in Australia but I will be sure to look next time I am at the store. Worth taking a look, especially if you don’t have access to good quality fresh artichokes, which is unfortunately my case most of the time. Thanks for stopping by, Marcellina! Whenever I see fresh porcini mushrooms in my specialty grocery store, I buy as many as they have! We bought many pounds of them this summer in Italy, although, considering the drought, they were probably from Romania. Nonetheless, they were excellent! I wish I had known about this dish them – for now, I will have to make it with other wild mushrooms. I, too, have found that frozen artichoke hearts definitely have their place my kitchen. Thanks for another great recipe, Frank. I didn’t realize there was a drought this year. May explain why I can’t find porcini for love or money around here, either fresh or dried! Ha! Frozen peas are awesome. Not better than fresh from the pod, but 1000% better than canned. This dish looks really good and I always enjoy your posts! There is a small independent grocery store in my town that has porcinis when they are in season. I will make your pasta the next time I see them. Lucky you! I’m having trouble even finding dried porcini this year! Frozen artichokes are good, but there is nothing as delicious as using fresh artichokes. How I wish we had the array of artichokes you find in Italy. I’m thinking of those wonderful heaps of artichokes in Rome’s Campo dei fiori, and the vendors who sit there trimming mounts of them each day while they’re in season. Your bowl of tagliatelle with carciofi and funghi looks so appetizing, Frank. Hope you had a wonderful Thanksgiving. I’ve got a few jars of artichoke hearts in my pantry. Not come across frozen ones in the uk, yet. My husband is going to have this for supper tomorrow night! Enjoy! If you’re using jarred artichokes, I’d blanch them a bit more than you otherwise would. That will tone down the taste of the brine that they are usually packed in. Good idea. I don’t like the briny taste. Thank you. Thank goodness for farmer’s markets is all I can say…and I’ve bought frozen artichokes from W. Foods…as you say, getting good ones (perhaps if you live in California it wouldn’t be problematic) is impossible. And fresh Porcini…well…all I can say is we can hardly wait to go back to Italy! So, like you, we buy foraged Chanterelles picked up at the farmers market. They are a fine substitute in my opinion. That’s one good looking plate of pasta Frank! Thanks, Phyllis! It’s “good” to know that I’m not the only one facing challenges sourcing these products. Funny, I actually think the situation might be getting worse rather than better lately. Love this recipe and the use of frozen artichoke hearts. Although I live within driving distance to Watsonville & Castroville, the source of artichokes grown in the USA, sometimes I just don’t have the time to clean fresh artichokes. I have used the combination of frozen artichoke hearts & shallots for a soup base in the past, with excellent results. Thank you for another wonderful go to recipe. Thanks, Paula. Yes, frozen artichokes really are a convenience. Even better were the pre-trimmed artichokes I used to buy back in Rome, as mentioned by Linda. Now that combined wonderful flavor and convenience. Who could ask for more?